A perfectly glorious winter’s day and the view from the next parish. I went for a walk today and it was glorious! What a truly perfect winter’s day! Clear blue skies (Veronese blue in fact, honestly! ), a few puffballs of cotton wool to enhance the blue. Very strong winter sun – aviator shades being required eyewear! It was perfectly dry underfoot and only a light jacket was required – in fact a good woollen pullover would have sufficed, since it was comfortably warm, due to the almost total lack of wind. Yesterday was so dull! A thick uniform blanket of low cloud and no wind made the place dark by 4.30 pm. There is a view in both Ireland and the USA that if you said due west from Ireland, the next piece of land you encounter is somewhere around Boston – Massachusetts, that is. Hence the phrase used in the Dingle Peninsula – the next parish is Boston. In fact this couldn’t be more wrong. 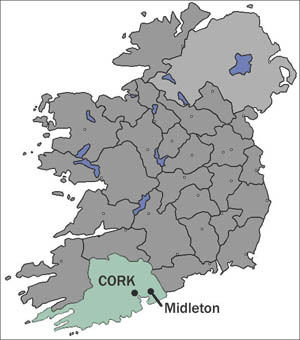 Cork, and therefore Midleton, lie on the 51st parallel. Or 51 degrees 54 seconds north to be more precise. This is a similar latitude to the northern parts of London (England) and the town of Gloucester (England), or slightly further south than Amsterdam and Haarlem in the Netherlands! (And we Irish think of continental Europe as ‘south’!) On the other side of the Atlantic, the equivalent places are: Saskatoon (Saskatchewan, Canada) and Adak in Alaska! For your information, Boston, Mass., is located at 42 degrees 21 seconds north – nearly ten degrees further south! Even Detroit and Chicago are located further south than Ireland! Yes, we have such balmy weather on 30th November 2014 – how come? Well, it’s due to the Gulf Stream bringing lovely warm moist air from the Gulf of Mexico (you know, that bit of water south of Texas!). This keeps Ireland wrapped in a nice warm bath through the winter – so temperatures rarely drop below freezing long enough to give us the type of snowstorm that hit Buffalo NY recently. Indeed, one snowflake is all it takes to bring the country to a halt! Okey, I’m exaggerating but you get the picture. The Gulf Stream is what gives us our forty shades of green – because, when combined with the Jet Stream, it brings a lot of moisture to Ireland (rain – yes it DOES rain in Ireland!). The Jet Stream wasn’t fully functional here today, due to a ‘blocking high’, that is a high pressure area over Ireland blocking the weather fronts. Among the benefits of being so far north are the sixteen and a half hours of daylight in June (when it isn’t raining!). Sadly, we pay the price in December with a mere seven hours and fifty five minutes of daylight – why do you think pubs are so popular here? So, the next time someone tells you that the next parish to the west of Ireland is Boston, you might usefully suggest to them that the next parish to the west is actually in NEWFOUNDLAND!